EasyEDA does not support true hierarchical designs but it does support multi-sheet designs. You can put several schematics in one project with connections between made by NetLabels/netPorts. All nets in EasyEDA are global so if you create a netlabel DATA0 in sheet A and then create a netlabel DATA0 in sheet B, when sheet A and sheet B are in the same project, they will be connected. Multi-sheet designs(equivalent to a circuit spread over several pieces of paper), all schematics under the same project will be merged into one when be converted to PCB connecting in netlabel, netflag. 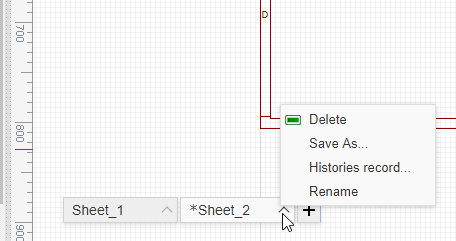 You can click the Sheet tabs on the left-down corner to switch the Sheets, and right-click the sheet tab you can “Save as”, check “Histories record”, “Rename” and “Delete” the sheet. If you want to arrangement the sheets order, you click the menu of the sheet icon: Move Forward/Move Backward. EasyEDA support global unique prefixes, when you place components in different sheet, the editor will auto annotate the prefix. If you save as a sheet to another project, please make all of the prefixes unique, if the Sheet A has a R1, and the Sheet B has a R1, then you will get a Prefix Conflict Error.